A couple weeks ago, my 3 year old Elsie started (full day!) preschool. She is loving it and I'm so thrilled she is. I haven't been very emotional about either of my kids starting preschool, I just think it's so exciting for them, and for me. Hendrix starting Kindergarten was a different story though. It's like mourning their little-kidness when they start real school. But for me it wasn't just because he wouldn't be at home as much and I'd miss him. It was because for the rest of their lives after that first day of Kindergarten, they have expectations on them. Responsibilities and potential stressors. Forever! It's a little overwhelming to think about and it caught me off guard as we drove home from dropping him off at school. So long carefree kid life, you have things you have to learn and do now. It's a big transition, but a good one. Anyway, that's not really what this post is about, but I thought I'd tell you because no one told me that that is what I would get emotional about. I always thought it was just a bunch of clingy moms who cried about Kindergarten. I was wrong, no judgment here, crying moms and dads. 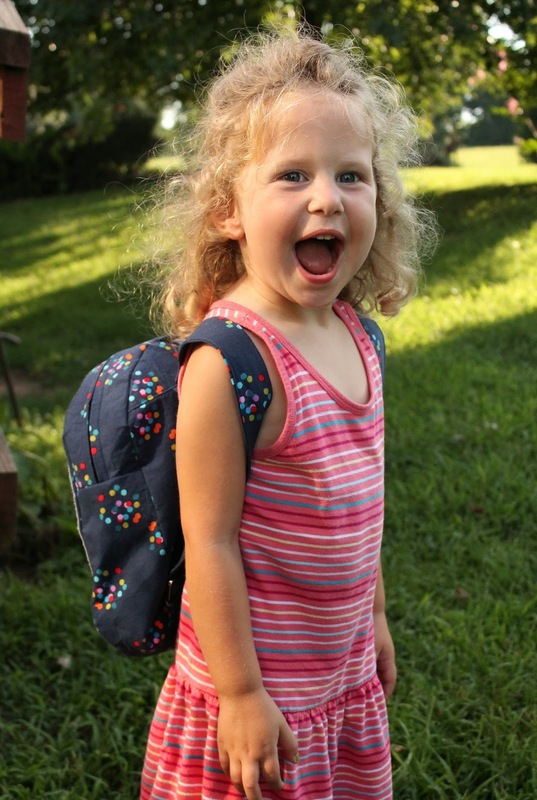 So Elsie's backpack- it's the pattern from Liesl's Little Things to Sew and it's the second one I've made. The first time I did the penguin version for Hendrix three years ago. (You can also see a whole lot of other great versions on that link from the sew-along we did!) If you still don't have that book, what's the matter with you? Still consistently my most used sewing book ever. 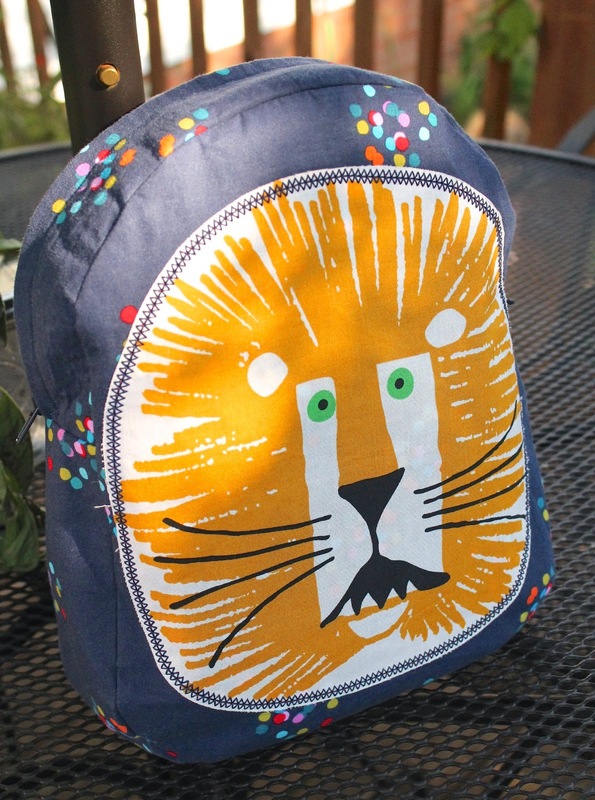 This is the basic version of the backpack, but I added the lion appliqué from an Ed Emberly panel print I bought a long time ago. My kids love EE drawing books, and Elsie is especially crazy about lions right now, so I was thrilled when I remembered this lion that would fit perfectly on the front. And I got to actually use a decorative stitch around it, which is something I never think of doing. Come to think of it, I actually don't like the look of decorative stitches, but I love it here. The main fabric is a print from the RK Blythe collection that I had in my stash from Sewn (Have I mentioned how much I miss Sewn? I will say it again.) 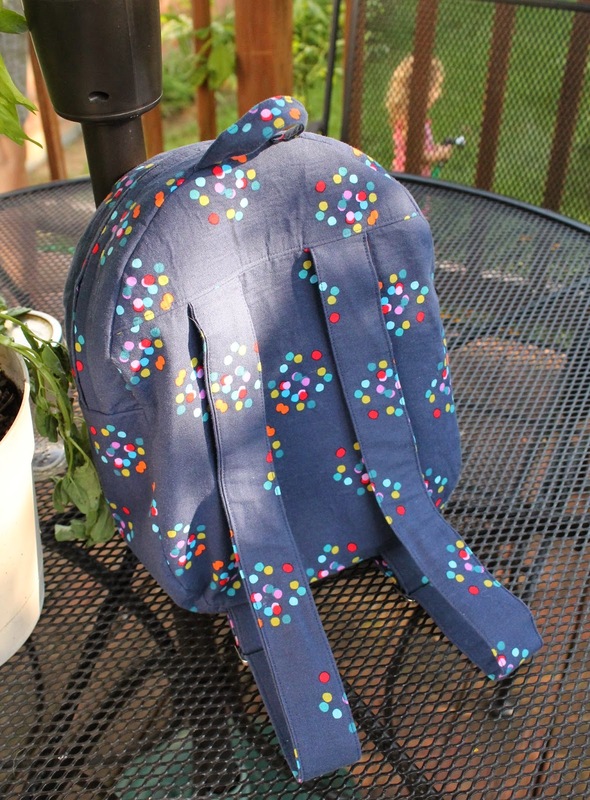 I interfaced it with Pellon Decor Bond which is the perfect weight for the backpack. I think the navy and dots make a fantastic background to the lion, so I'm glad I ended the hoarding period with this fabric. The lining is a Confetti Dot from The Fabric Studio, which is just opened in Nashville this past spring. This shop is so cozy, and the owner Nancy is super talented and helpful. Definitely put it on your list of fabric shops to visit! The little ladybug is also from that Ed Emberly panel. 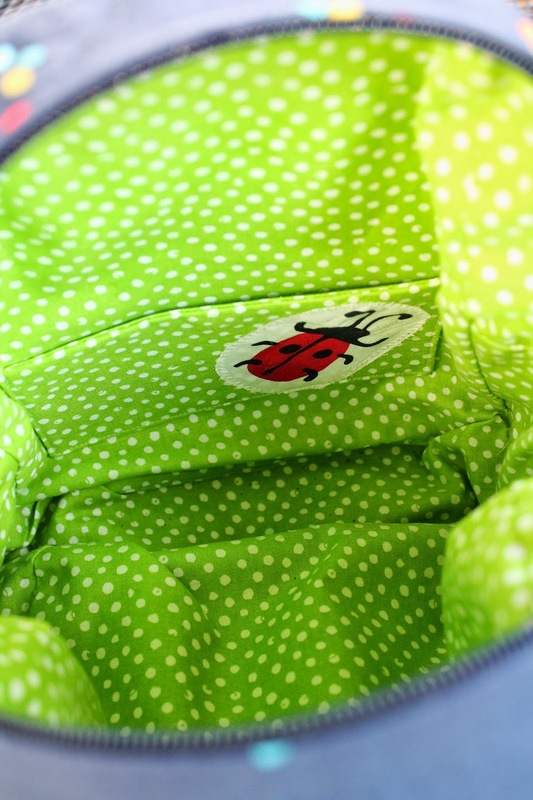 Lady bug pocket? Sure, why not. 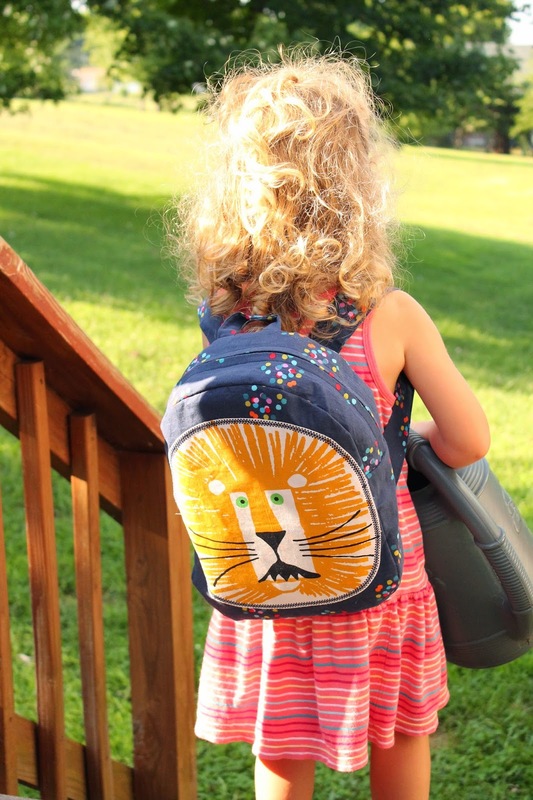 Sometimes you need a lion backpack to water Nana's flowers. You also need it to carry a "Little My Pony" lunch box and a Batman water bottle to school. I mean really, she is just the best. 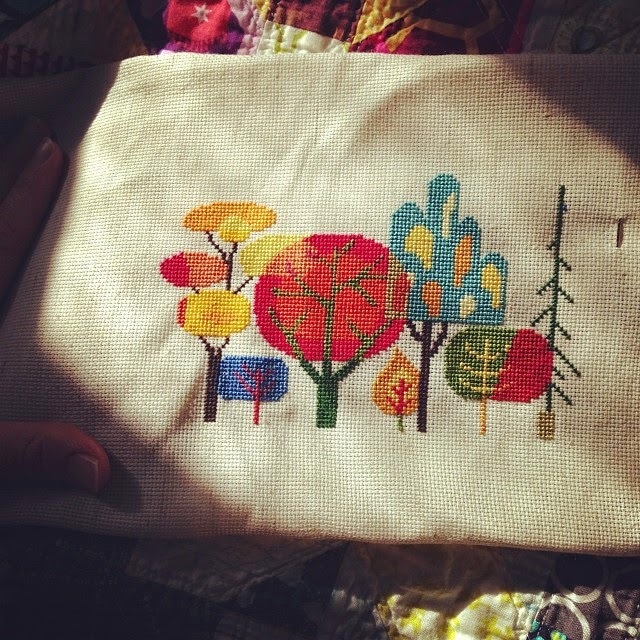 But then my friend Kara posted a picture of this Forest pattern she was working on, by Jody Rice of Satsuma Street. Love at first sight. I HAD to relearn cross stitch just to make this pattern immediately. 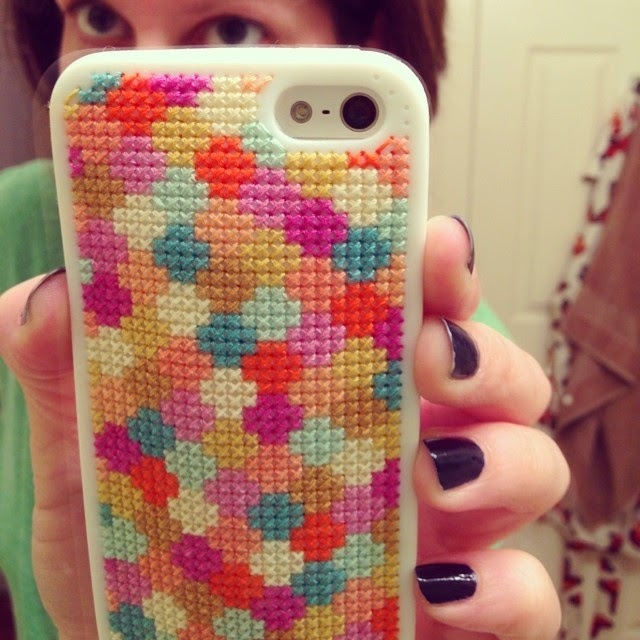 (Really, cross stitch is amazing simple- not much to learn) And then a whole bunch of her other patterns. Honestly, if there was no Satsuma Street, I would feel no need to take up this craft. But I'm glad I did. I promptly made up a zipper pouch for my stitching projects, shown above on the left. It's scraps from a 16 patch quilt top I made around Christmas time last year, and it has room for all my goodies inside. I didn't get a picture of the finished Forest piece, but I did finish it (in March maybe?) and wrapped it around a canvas and sent it to a good friend. 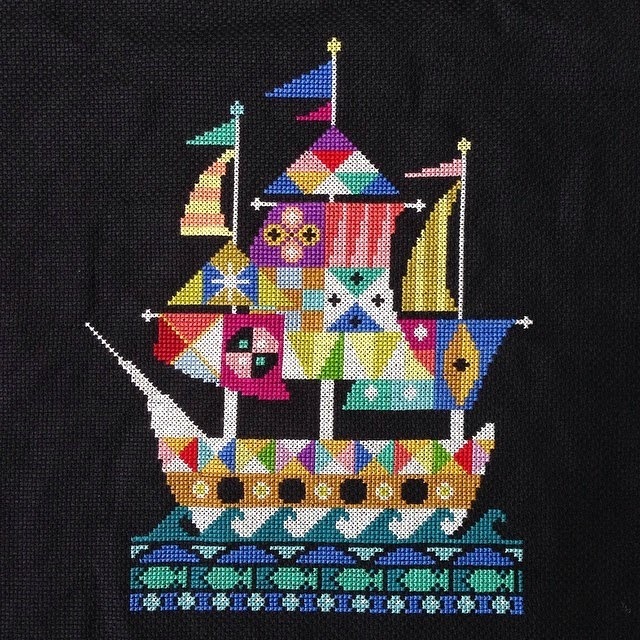 I was still hooked on stitching Satsuma, so I immediately began this Voyage pattern. This one took even longer to finish, but I loved every stitch. The colors are just so genius! I love how I can stitch while watching evening TV with Nick or while on a picnic with the kids. I also love having an excuse to use these adorable stork scissors from The Fabric Studio here in Nashville. It's all finished now, but I still haven't decided on what to do with it. I had considered sewing it into a tote, but I usually get tired of bags eventually, and I never want to get tired of looking at this. Plus bags get grungy. Yup, this one needs to hang on the wall, but I don't know if I would rather wrap it on canvas or frame it. My most recent finish was this phone case. I used some of my favorite colors I already had from other projects and just kinda made up this hexagon design. 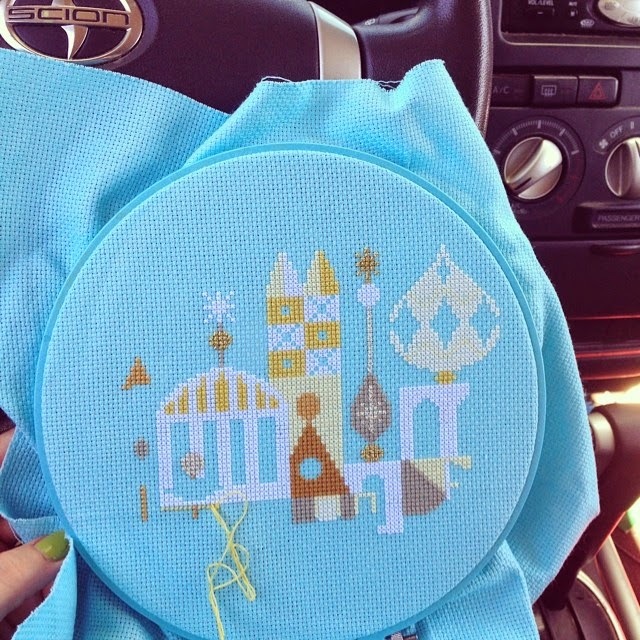 I found the stitchable case at a craft fair in my Cincinnati neighborhood from a booth set up by the Hoop and Needle. I don't know if you can order it from their online shop, but you can find lots of fun pdf cross stitch patterns with profanity and Big Lebowski quotes and the lyrics to Dayman. (Have to make that one!!) They've also opened up a brick and mortar shop on Main St. in OTR. Definitely go support them if you are local. Can't wait to visit next time I'm in Cincinnati. Currently I'm working on Arcadia on this happy polar ice blue Aida. This isn't even a quarter of the pattern done, but now that I've joined the ranks of moms in the car pick-up lane, I get some stitching in every afternoon. I think I love her patterns because of how she groups the colors in those large chunks. It speaks to my style much more than Kawaii or those cross stitches that are so detailed they look like paintings. It feels really modern, like a quilt in pretty solids. And: you can't really tell in the picture, but this one has some metallic threads in it. Oooooh, fancy! We are wild about Fanfare flannel! I never thought I'd do it. The whole matchy-matchy with my daughter thing. But it was necessary with this foxy Fanfare flannel by the amazing Rae for Cloud 9 fabrics. It would have been a crime not to! Like everyone else, I've been wanting to make Purl Soho's (FREE!) City Gym Shorts pattern ever since I first laid eyes on it. And I've been desperate for new PJ shorts for me, so a free pattern definitely hit the spot. I also have that whole weird thick-mom-waist-skinnier-hips proportion going on, which has always made me afraid to sew my own shorts or pants. But simple elastic waist shorts weren't intimidating at all, and turned out just as comfy as you would think. After mine were done, I had enough foxes and solid purple (sent courtesy of Cloud 9- thank you!) to make Elsie her pair. 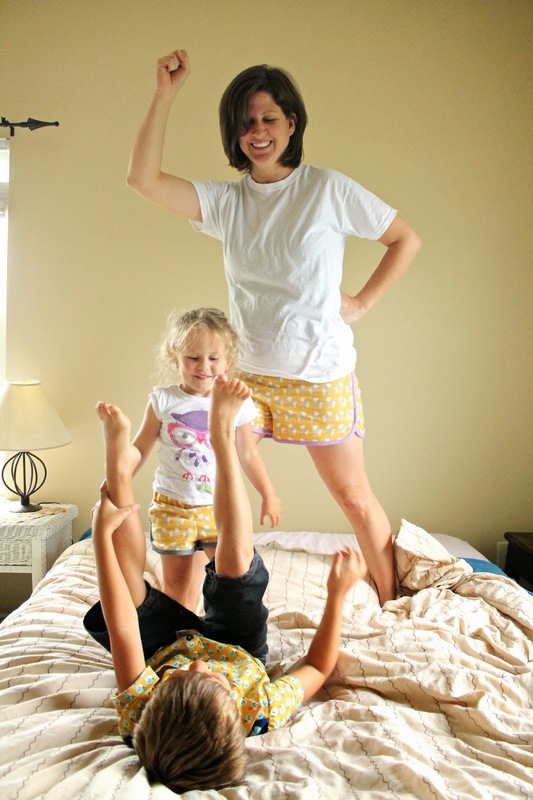 Everything's cuter on a 3 year old, but most importantly, this pajama party photo-shoot desperately needed the 3 year old. I'm sure my awkwardness modeling shorts alone would have known no bounds. So thanks to Cherie for the fun inspiration from her Lotus Pond pictures! Let's talk about this fabric. It's a really super nice flannel, much softer and higher-quality than the stuff you can buy in the big box stores. And the new colors of the Fanfare re-release are so fun. I love that the prints are still so sweet for baby projects, but the brighter colors make it irresistible for any age and a whole range of projects. Even though my shorts will mostly be worn an home, (ahem, we did both wear our shorts out to the county fair last night!) I went ahead and used chambray trim on Elsie's so that they looked a little more like "real" shorts she can wear to preschool. I love the combo! Let's all ignore the fact that her waistband foxes are upside down though. 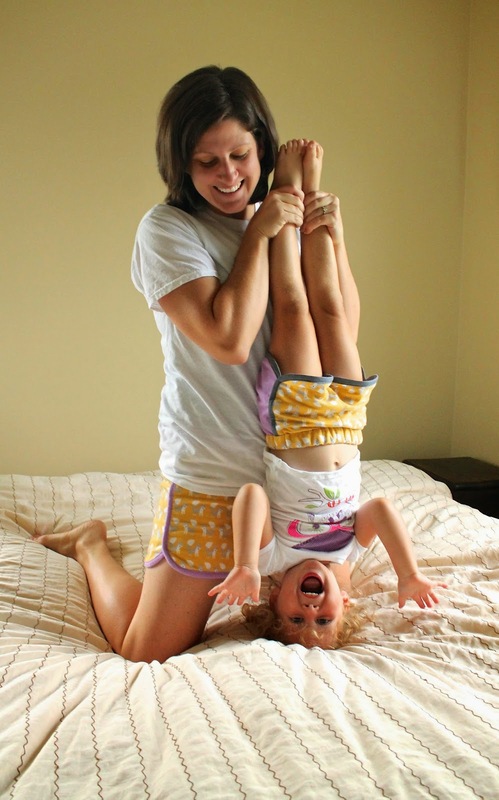 My husband was nice enough to take pictures for me, and after a while of watching from the sidelines, Hendrix couldn't resist the mom-sanctioned bed jumping. But it's cool, he happened to be wearing his Rae fabric as well! Rae fan club. Then I missed the memo about the superhero poses being over. Try and keep up mom, so uncool. It's been a while since I participated in an online swap, but this one did not disappoint. My buddy Heidi organized it for Sewn Studio, where I used to work part time before moving from Cincinnati. Oh man, do I miss that place! So even though it was online and anyone could participate, a lot of the swappers were Sewn customers. When I got my partner's info, all she specified was that she liked both modern and traditional stuff, and she didn't like girly purples and pinks. But she also said she really likes baking and canning, so I decided to make her a table runner. It's shown here as a wall-hanging, which it could easily be used as, if she's not into table runners. My mom and I have been working on a quilt together of all the Anna Maria Horner fabrics my mom bought at her studio when we went to the MQG Sewdown together in April. (I neglected to blog about that, but it was amazing- workshops with Carolyn Friedlander, Victoria Findlay Wolfe, Angel Walters, and AMH, plus dinner music and studio tour at Anna Maria's home here in Nashville. So wonderful!) Anyway, there were a bunch of tiny scraps from that project that I just started sewing together into improv-y little patchwork panels. Then I decided to add Essex linen in steel (I think?) to make them into modern crosses with slight variations on size and positioning. It's one of those projects that just grew organically without a clear plan and I absolutely love the end result. Every time I sew that way, I enjoy it so so much. I don't know why I don't do things like that more often. Sometimes it feels easier to just reach for a pattern and follow it without having to think too much, but really, when I take more control of it myself and put more thought into the design, it's that much more pleasing at the end and all though the process. The back is just the leftover patchwork bits along with bigger pieces of True Colors. 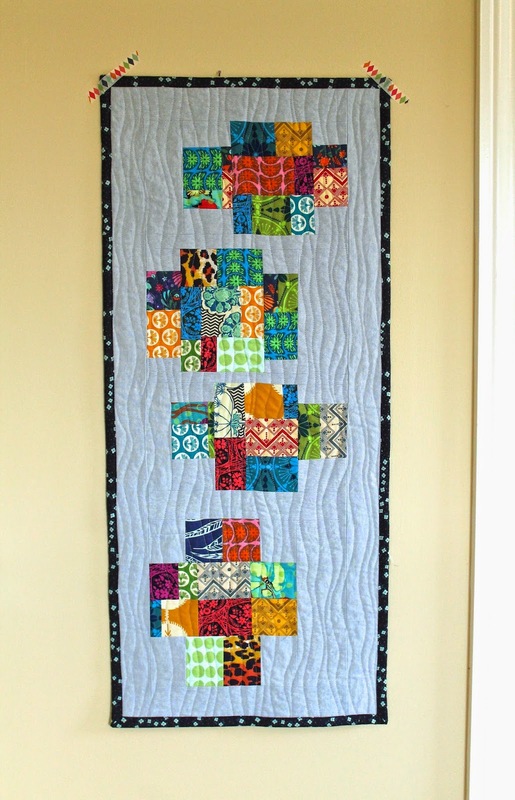 The quilting is wavy organic lines with my walking foot, and the binding is a Julianna Horner print from Joann. I love how well the mother/ daughter fabrics go together! This one was a little difficult to send away, but at the same time it always feels good to send your best out for a swap partner. I also whipped up a quick Heather Ross zipper pouch and stuffed it with scraps to send along. (Cutting measurements: 12"x5.5" and 12"x4.5 contrast for the outers, 12"x9" for the lining and interfacing, and a 3" wide boxed corner.) This is my go-to pouch size for gifts. The day after I finished up my swap items, I got my amazing package in the mail from Amanda. I could not believe all the work she put into my gift, and she picked the perfect fabrics for me from the Indelible collection. Plus I was so happy to receive from Amanda, a friend I know from Sewn. The bag is the Senna Tote by LBG Studio, and it's a GREAT tote. So roomy with convenient outside pockets- this one will get a lot of use Amanda, so thank you! This morning as I was sitting down to write this post, I got a very sweet comment on my last post (from over 2 months ago) asking if I was taking a summer break and saying my posts were missed. Well gosh. That made me feel great! So at least one person will be happy to read this. That one person, and my mom. I guess you could say I have been taking a summer break, though I didn't really try to, it's just the way things go during a time of lots of transitions. And I mean LOTS. We have moved to the Nashville area from Cincinnati, my husband just started a new job, Hendrix just started Kindergarten, Elsie is in full-time preschool, and I'm signed up for some courses and going thru the many ups and downs of searching for full-time-work-after-stay-at-home-motherhood myself. Phew. Of course I've managed to sew a few things during all this time, (how do normal people cope with changes if not with furious stitching?) and now I have quiet mornings alone in the house and I've got that cyclical "I'm gonna blog again, gosh darn it!" feeling going on. Life is made of seasons, so are blogs and ideas and relationships and ambitions and run-on sentences, turn, turn, turn. Obviously, when you are a slow and seasonal blogger, not all the makes get posted about. (Most of them are on IG though, @alittlegressica.) But I always feel like I owe it to the quilts. The quilts must be honored! Well yeah, they take a long damn time to make. 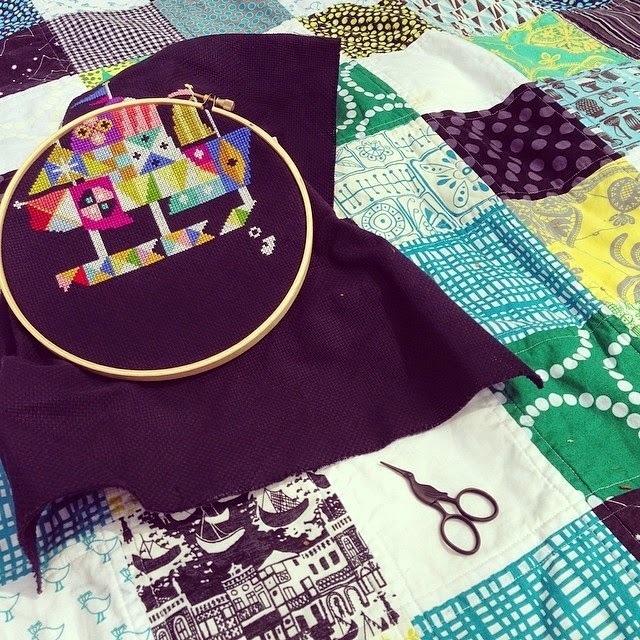 Back in May, I set out to make a throw quilt for both of Hendrix's preschool teachers from last year as end of the year gifts, just like I did the year before that. I made the same designs, just 10" squares in 6 rows of 6, and I used the opportunity to use up some larger scraps and tie them together with some other fat quarters in my stash. So with a simple design like that, I always assume it will be quick and don't leave enough time. But then I think I have enough time, so I irrationally think, hey! Let's use this quilt to practice a different free-motion design in every single square! Yeah, that really adds to the work time. I was kicking myself and whining about my shoulders like a big wuss, but it was fun, and definitely good practice. It was great to learn which designs I really enjoyed doing, and which ones were just good to know, but not my go-to's. 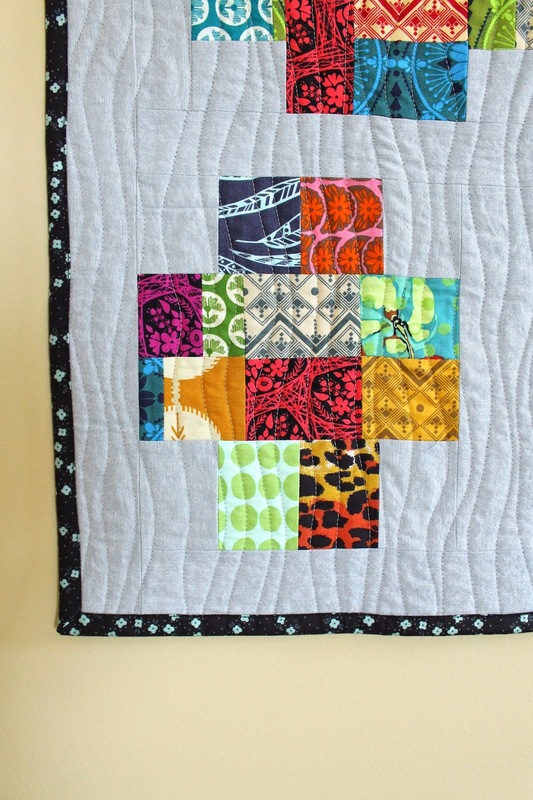 At first I thought the patchwork of quilting squares you can see on the back was too weird, but after washing, the crinkle brings it all together in a coziness of rad quilting. This teacher got the more teachery looking quilt- with the primary colors and typographical prints. Those are from some Moda panel I got on sale ages ago, and it ended up being perfect for this purpose. I wised up on this one and did a quick and simple quilting design. 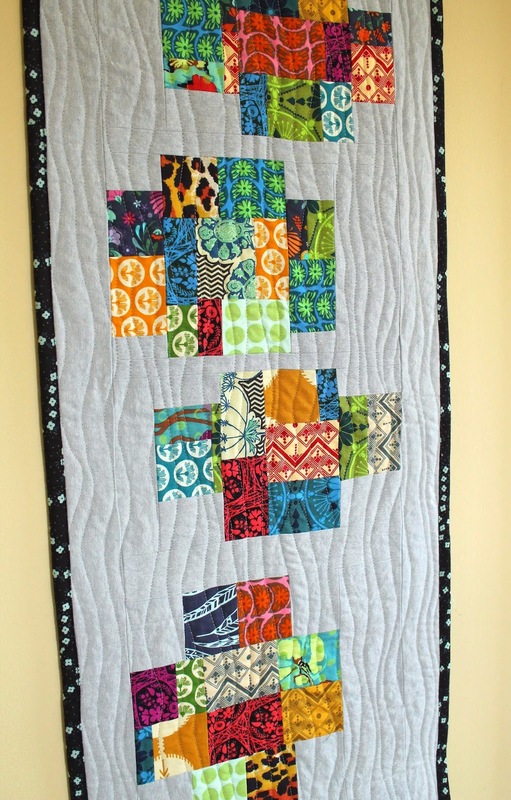 This design really is easy for free-motion quilting, but I loooooove the way it looks and feels on any quilt. Definitely a go-to. Now that Hendrix is in school school for like the next 13 years, I'm not sure if his teachers will keep getting quilts. But Elsie's preschool teachers might... 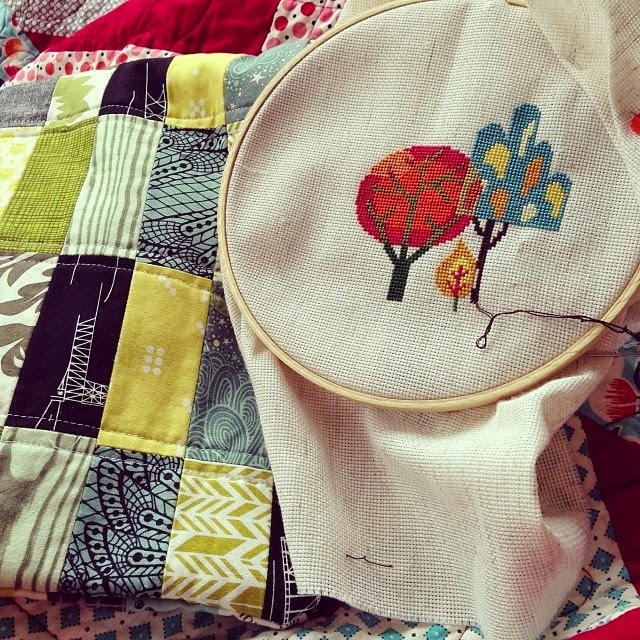 I just love giving special people quilts more than anything, so I'm sure I won't be able to resist.